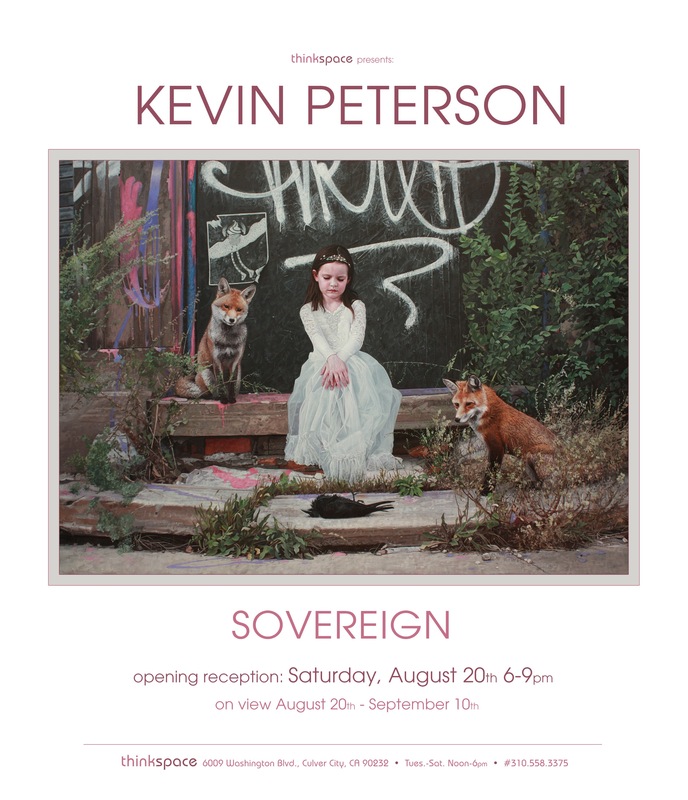 (Los Angeles) – Thinkspace is pleased to present new works by Kevin Peterson in Sovereign, the artist’s third solo exhibition with the gallery. The Houston-based painter is known for his hyperrealistic works in which urban sprawls and rough city landscapes are offset by innocent subjects. 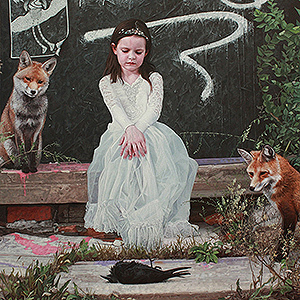 Children and wild animals peacefully coexist as complicit companions in the detritus of stark urban environments. The poetic staging of these unexpected oppositions visually elicits powerful psychological themes. Recurring concepts continue to surface in Peterson’s work, like the perpetuity of change in self and environment, the navigation of personal trauma and loss, and solitude and the pursuit of companionship. Peterson’s surreal compositions are meticulously laid out as preliminary studies with photographic references and models, then rendered imaginatively in oil on panel with deft detail and technical finesse. Everything from the figurative, the animal, and the inanimate is brought to dimensional life with expert attention to light, minutiae, placement, and context. Each work is meant to capture a fleeting moment; these encounters are ambiguous and fragmentary glimpses, suggestions of a universe colonized entirely by unlikely partnerships forged between the wild and misplaced. The artist creates visual narratives that challenge our expectations of context, suspending the divisive nature of adult disbelief. Unexpected alliances thrive between wild beasts and young children in counterintuitive city environments. The compelling fantasy evolves from the interrelationships and staged contrasts of these incredible collusions and whimsical conspiracies; the youngest of protagonists find steady companions in wild foxes and bears, apprehensively navigating the solitude of the city. In fact, the adult human world is all but absent, seen only through the darker remnants of its urban leftovers and castaways; the legacies of its failures remain: old structures and abandoned spaces, industrial vacancies, and forgotten recesses. The bystanders of adult failure tread resiliently in these voids: nature and childhood. In earlier works Peterson had focused on a closer, cropped, and more portraiture oriented view of his subject. In these and more recent works, he has widened the frame and opened the narrative, capturing more of the subjects’ environment, context, and interaction with the landscape. Graffiti graphics continue to figure prominently on the street structures in his work, looming suggestively in the backdrop and walls of these spaces. Reproduced in perfect detail and sourced from photo references of actual sites, Peterson develops a convincingly realistic snapshot of the cityscape in which to stage the wandering of his innocents. Their journeys, and what they are in search of, remain forever out of reach, but their pursuit and resilience resonate universally with our shared restlessness and disappointed inheritances.